Can you imagine what farming looks like in downtown Tokyo? Is it even possible? You might be surprised to find out it is most definitely within the realms of possibility: it is called high-tech urban farming. 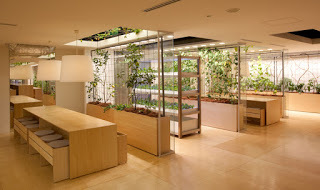 Pasona, located underneath an office block in the middle of Tokyo, near Tokyo Station, dedicated itself to creating this urban farm in part because of the growing reliance of foreign food. With a shortage of arable land in Japan (roughly only 12%, compared to 20% in the US and over 50% in Denmark), the country’s food supply is highly unsustainable. By having this urban farm, Pasona is working to encourage and educate new farmers, while exposing urban people to food while it is growing. Considered to be the farm of the future, The farm occupies 10,000 square feet in six separate rooms. It has been created by the Pasona Group (a company specialised in Human Resources) to spark a new interest in farming and the lifestyle that comes with it among urbanites, and make people think about the way they use their environment. Ripe tomatoes hang from conference room ceilings, rice paddies grow waist-high in the lobby, and a living façade of flowers and orange trees covers the expanse of the building’s exterior. 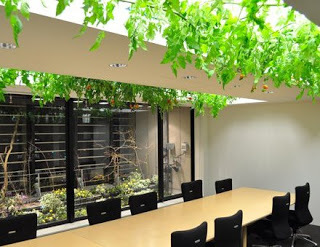 There’s no shortage of agricultural variety around the Pasona office building, located in downtown Tokyo, Japan. In total, over 200 species of fruits, vegetables, and rice live within Pasona, including lemons, broccoli, salad greens, berries, squash, eggplant, and passion fruit. 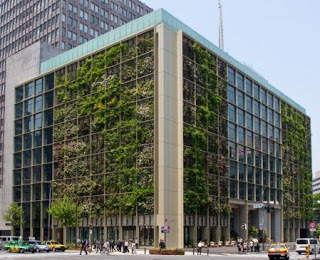 Two hundred species of edible greens occupy a quarter of this 215,000-square-foot office in Tokyo, Japan, sharing space with thousands of workers who in turn consume harvested fruits, vegetables and rice right in the building’s cafeteria, a direct farm-to-table connection. Plants are expertly interspersed with other functions throughout the building, sustained via soil-based and hydroponic systems, including 1,000 square feet of rice paddies and extensive broccoli fields. While the remodeled mixed-use Pasona facility is not exactly a secret, the building’s living green facade only indirectly hints at the vast food production going on inside of this combined commercial and agricultural space. Over 43,000 square feet of space is dedicated to the vegetation, and together with the automatic irrigation system and HEFL, fluorescent, and LED lighting, this office space is essentially a complete indoor ecosystem. Species-specific HELF, LED and fluorescent lamps are coupled with automated irrigation systems and climate control technologies through that monitor and adjust humidity, temperature and airflow. The system is optimized both for human occupants by day and plants by night, to satisfy workers and optimize yields, respectively. As young people migrate to cities in ever growing numbers, so grows the concern for the future of agriculture. Prototypes for urban/vertical farms have been developed and, considering projected urban growth, seem a likely forecast for our future. In the offices of Pasona, the future has already arrived. 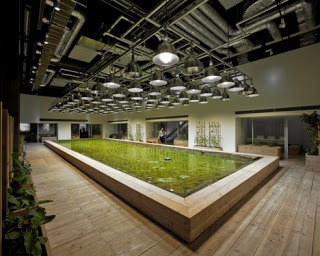 The Tokyo based recruitment agency has dedicated 20% of their 215,000 square foot office to growing fresh vegetables, making it the largest urban farm in Japan. 0 Response to "Utilizing vertical Farming as Sharing of Office Space"